Exit off Route 81 at exit 182B (Davis Street exit). Make a right at the Stop Sign at top of ramp; go straight through 3 more lights (about 1.5 miles, known as the Minooka Section of Scranton). At the fourth light (in the boro of Taylor), turn left onto Main St and follow into Old Forge (about 1.5 miles). At Vine St (across from the Stewart Memorial Chapel), turn right onto Vine and go straight to Church St (second stop sign, must go right or left). Turn right onto Church St and follow for 2 blocks. 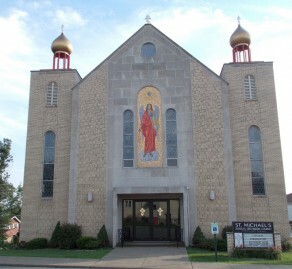 The Church is located at the corner of Church and Winter Sts. Take Route 81 to exit 180 (Moosic). Follow signs to a light in Moosic, and turn right. Go one block to a “Convenient Mart”. Turn right onto Moosic Rd and follow into Old Forge. At light, make a right, then an immediate left onto Oak St. Go 4 blocks to Church St. Turn right at Church St and go to top of hill where Church and Winter Sts intersect. After paying your toll ticket at the Wyoming Valley Plaza, stay on the Turnpike until the next toll plaza (requires a 50 cent fee), exit immediately after tool booth to the Keyser Avenue/Old Forge Exit. At stop sign on Union Ave. go left, then at traffic light make another left. Proceed into Old Forge on Keyser Ave. until junction with Oak St. (Soyona’s Quick Mart and gas station is at this intersection). Make a left onto Oak St. and follow it around until Church St., make a left on Church and travel to the corner of Church & Winter Streets where the Church will be on your left and our parking lot will be on our right. NOTE: There are directions signs mounted on the telephone poles at the corner of Oak & Keyser and Oak & Church pointing you towards the church. After paying toll at Wyoming Valley Plaza, take first exit to Scranton and I-81 North. Follow signs that get you to 81 North and take 81 to exit 180 (Moosic). Follow signs to a light in Moosic, and turn right. Go one block to a “Convenient Mart”. Turn right onto Moosic Rd and follow into Old Forge. At light, make a right, then an immediate left onto Oak St. Go 4 blocks to Church St. Turn right at Church St and go to top of hill where Church and Winter Sts intersect. 6:00 PM Liturgy of the Presanctified Gifts. Confessions are heard 1 hour prior to the start of the Liturgy.